TaxMasters, already the target of complaints from two state attorneys general, has filed for bankruptcy. 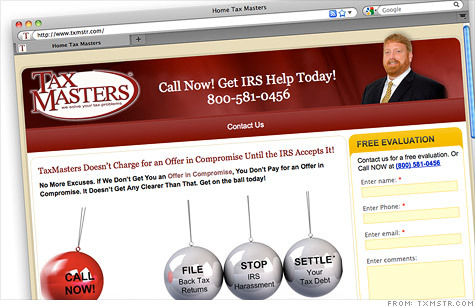 NEW YORK (CNNMoney) -- TaxMasters, the Houston-based firm that advertises it can help consumers facing problems with taxes, filed for bankruptcy protection Sunday. The firm, which had a prominent ad campaign featuring CEO Patrick Cox on numerous cable networks, has already been facing complaints from the attorneys general of Texas and Minnesota, which accused it of deceptive practices. The complaint from Texas Attorney General Greg Abbott, first filed nearly two years ago, brought a slew of consumer accusations against TaxMasters (TAXS). The civil trial in that case finally got underway Monday afternoon when TaxMasters' request for a continuance was denied. The Texas charges included unlawfully misleading customers about their service contract terms, failing to disclose its no-refunds policy, and falsely claiming that the firm's employees would immediately begin work on a case. Sometimes the fact that TaxMasters did not actually start to work on a case until customers paid in full meant that taxpayers missed significant IRS deadlines. The complaint from Minnesota Attorney General Lori Swanson, filed in December 2010, alleges TaxMasters got customers to pay advance fees of $2,000 to $8,000 by misstating the help it would provide people with unpaid tax bills. In some cases, the company claimed it could reduce people's tax bills by up to 90%, but then delivered little or no help, according to the complaint, pocketing the non-refundable deposits. This complaint was settled in August of last year, with TaxMasters denying any wrongdoing but agreeing to reform its business practices in the state and pay $500,000. In addition, the Better Business Bureau says it has received more than 1,000 complaints about TaxMasters over the course of the last three years. The bankruptcy filing said TaxMasters owes creditors between $1 million and $10 million, and that its assets total only $50,000 or less. It did not list its creditors but it said it owes money to between 1,000 and 5,000 people and businesses. Robert McKenzie, a tax attorney and partner with Chicago firm Arnstein & Lehr, said this is the third such tax settlement service to go bankrupt recently, following the demise of Roni Deutch and another firm, JK Harris. All three had been actively advertising their services. "There are certainly reputable people doing this work," said McKenzie. "The problem with the ones that are failing is they've budgeted large amounts for advertising, and the intake interviews are done not by tax professionals but by sales people working on commission, and thus making unrealistic promises." The company's most recent financial reports show it spent nearly $16 million on advertising in 2010, eating up about 37% of its revenue. Among the networks TaxMasters advertised on was CNN, one of the parents of CNNMoney. TaxMasters recently restated results to show a $4.7 million loss in 2010, and essentially break-even results in the first quarter of 2011, the most recent quarter for which it has reported results. McKenzie said that the Internal Revenue Service is willing to settle cases for less than the taxes owed, but that in almost all the cases they end up taking the taxpayer's home and other assets, in addition to payments out of future earnings. He said almost three-quarters of taxpayers who apply to pay less than they owe have those applications rejected by the IRS. Calls to Taxmasters and its attorney for comments about the bankruptcy filing and complaints were not immediately returned. The company's Web site made no mention of the bankruptcy filing Monday, even though it had signaled a bankruptcy filing was planned in a filing with the Securities and Exchange Commission on Friday. The bankruptcy filing was made in Houston.